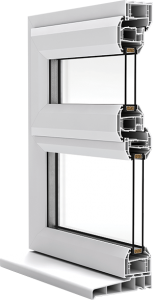 Like our market leading DK 70, the DK 63 is a complete suite of component parts, made to the same exacting standards, which enables the design, manufacture and installation of a full range of window and door components all from the same system. All parts in the range are made to provide you with a simple and trouble free installation, whist providing your customers with choice and a consistent stylish finish. Choose from either Bevelled or Ovolo design profiles according to the style of your home, resulting in a consistent finish across all areas of your home improvement (Chamfered or Ovolo frames available in the Elite 63 range). Post Co-Extrusion (PCE) Flexible gaskets are securely pre fitted to the profile during manufacturing preventing any shrink back through aging, which provides extended performance and keeps your windows in the best condition for longer. 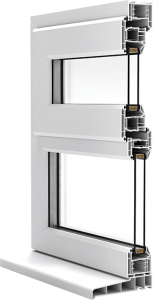 The DK 70 system is one of DK Windows and Doors’ flagship products and is used in a full range of window, door and conservatory parts – including Casement and Tilt & Turn Windows, Residential, French, Bi-Folding and Patio doors. Choose from either Bevelled or Ovolo design profiles according to the style of your home, resulting in a consistent finish across all areas of your home improvement (Chamfered or Ovolo frames available in the DK 63 range). Complete system with a full range of aesthetic accessories such as Georgian bars and decorative Horns increasing choice Both the Elite 70 and Elite 63 share common edge details with Spectus Patio Doors and Reversible 70 products resulting in compatibility across all product ranges, providing you with more choice and a consistent finish. Window Energy Rating of band A can be achieved through the flush glazing, which not only maximise Window Energy Rating but also improves the aesthetic finish. Beads available in 24mm – 44mm glazing options provides additional options against thermal and sound insulation.